The e-commerce titan said sales hit $31 bln during this year’s Nov. 11 event, another record and an impressive, though cooler, 27 pct increase on last year. That will ease some worries over Chinese consumption. Still, a day of online bargains is a poor indicator of future growth. 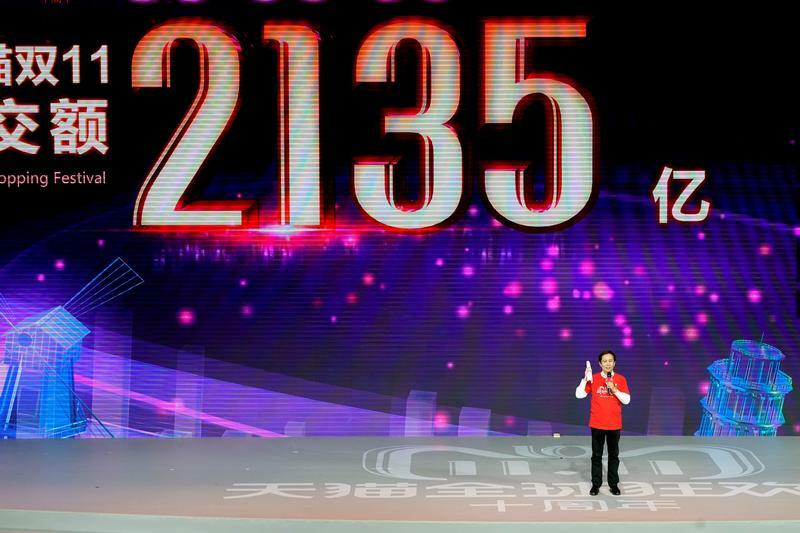 Daniel Zhang, Chief Executive Officer of Alibaba Group delivers a speech during Alibaba Group's 11.11 Singles' Day global shopping festival in Shanghai, China, November 12, 2018. Chinese e-commerce group Alibaba said its Singles’ Day shopping event saw 214 billion yuan ($30.7 billion) of online sales settled through its payments affiliate, Alipay. The 24-hour spree, similar to Black Friday in the United States, is held every year on Nov. 11. The total is up 27 percent from last year's record of 168 billion yuan, but marks the slowest rate of expansion yet in the event's 10-year history. Earlier this month, Alibaba revised down its outlook for full-year revenue, as e-commerce growth slows and trade tensions between the United States and China escalate.